Nikifor was a self-taught artist, he is ranked among the most outstanding naive primitive painters of the world. 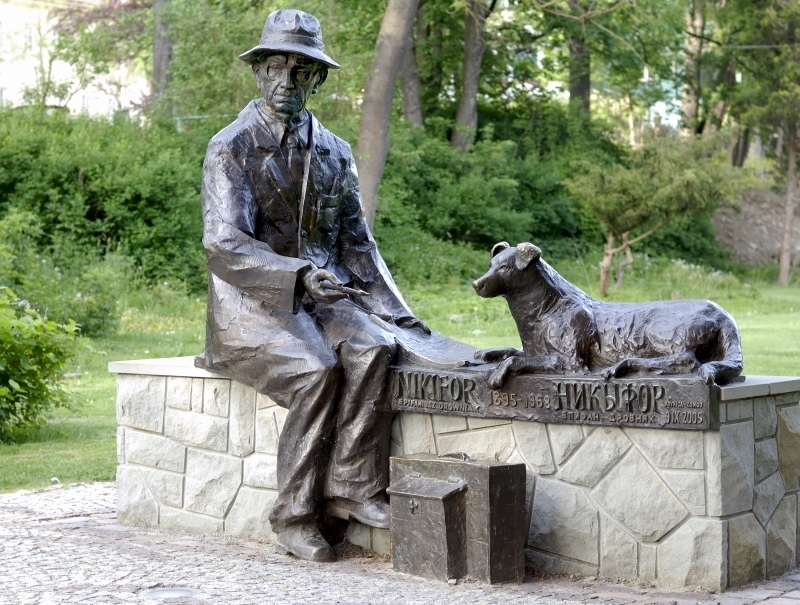 He was born on May 21, 1895 in Krynica. 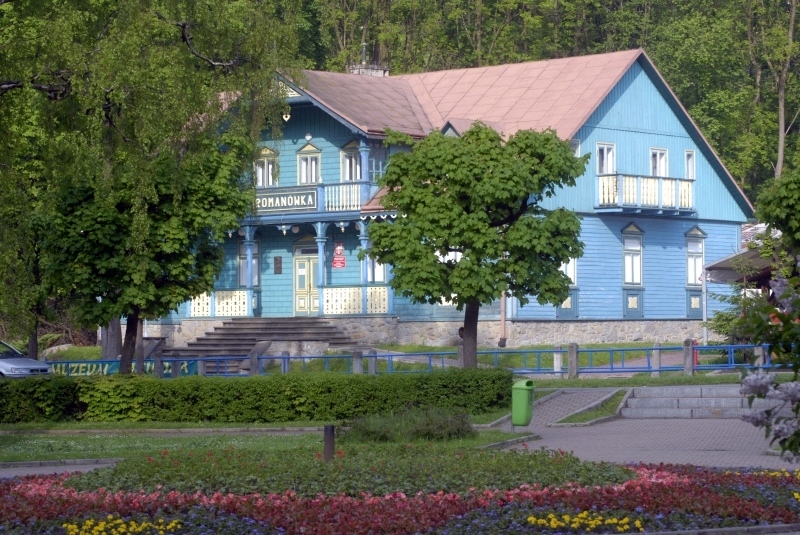 His father was a Pole and is supposed to be one of many artists painters who lived in villa ‘Three Roses’ – the biggest lodging house at the time in Krynica (according to one of the most widespread rumours Aleksander Gierymski was his father). His mother was Jewdokia Drowniak, daughter of Hryhorio and Tatiana of maiden name Krynicka from village Powroźnik. Jewdokia was a beggar-woman, who did the most humiliating work in the lodging houses of Krynica. With her illegitimate child she lived in total seclusion. It was said that when she went to work she left a bundle with her child under the bridge. As his mother, who raised him in abject poverty and as a lone parent could only offer him miserable life, he had audition and speech defect. He became an orphan during the WWI. As he was not able to communicate with people of the environment where he lived, he was treated as a crank, humiliated and laughed at. After years of listening to his ‘gibberish’, he was taken to the throat specialist who diagnosed an innate defect – accreted tongue, which was the main reason why he had speech problems. Nobody is able to say where his name is from. Its original Lemko form was Netyfor. Until the year 1963 he hadn’t had a surname, he had used only a name. In that year he had his ID issued and officially received a surname ‘Krynicki’. In documents a ficticious date of birth and false parents’ names were written. 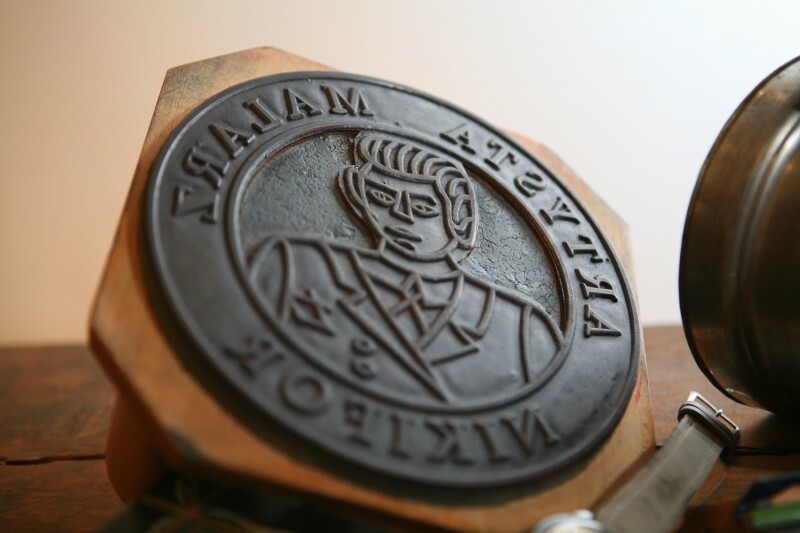 Only after his death in year 2003 – court in Muszyna judged that the real name and surname of Nikifor was: Epifaniusz (Epifan) Drowniak. At the beginning, orphaned Nikifor led a homeless life, wandering villages and towns of Galicia. 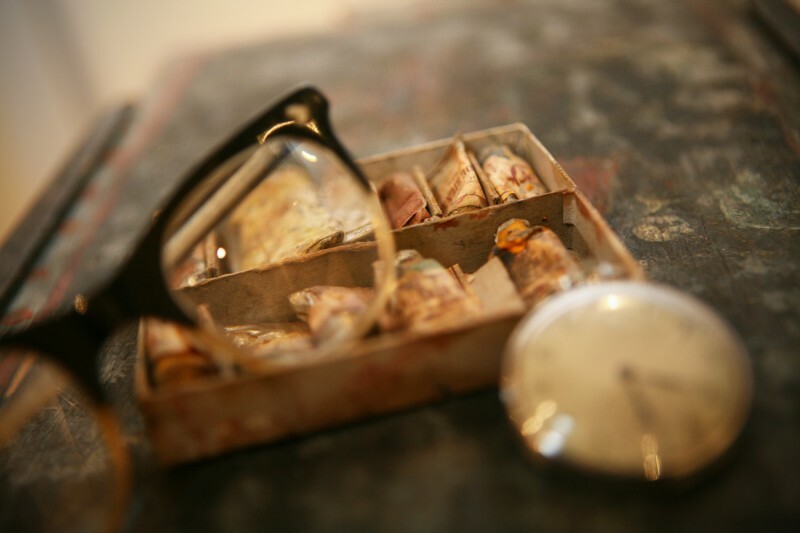 Around the year 1915 he started to paint pictures – to paint he used everything what was suitable – for instance Austrian official forms, disused exercise books, chocolate and cigarettes wrappings or wrapping paper. As a result of the ‘Vistula’ action he was sent to the north of Poland, somewhere near Szczecin. His paintings from that time show sea, pier, beach sunshades. Nikifor didn’t care about the decree of eviction or he was simply not aware of that and returned to Krynica. There, he met only few Lemko families (only ethnically mixed), so he became wanderer, an outcast to eventually transform himself into beggar with course of time. Authorities of Nowy Sącz prohibited registering Lemkos. Nikifor was evicted three times and three times he came back. These facts of his life (eviction and journeys) are reflected in his works. Lasting for years wandering caused deterioration of his health condition and resulted in tuberculosis. The oldest preserved works of Nikifor date back to 1920. Artist regarded himself as a professional painter, which is reflected in the fact that he named himself and his works after the great Polish painter. He signed his works ‘Netyfor painter’ or ‘Matejko’. He was a semiliterate person, therefore lopsided, full of mistakes inscriptions on his works. Every day he placed his ‘portable workshop’ in different places of the health resort, therefore he became an inherent element of Krynica for its visitors and inhabitants. 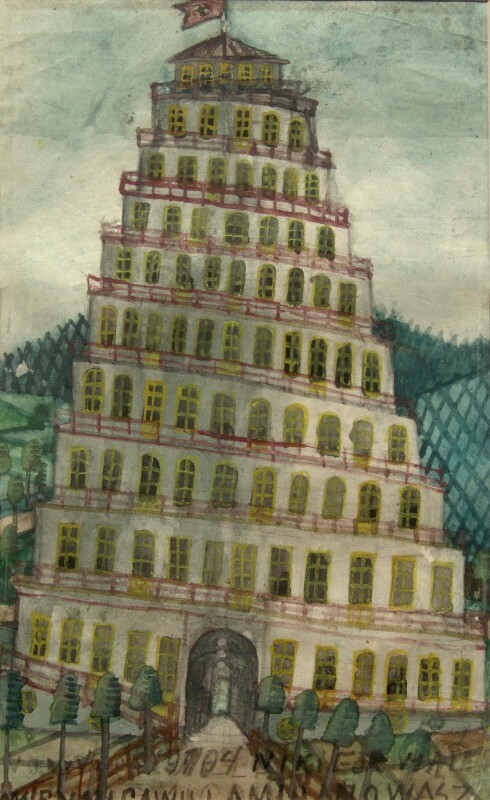 The majority of primitive works is painted in water-colours, sometimes connected with tempera and oil-colour (depending on money he had and help he received). 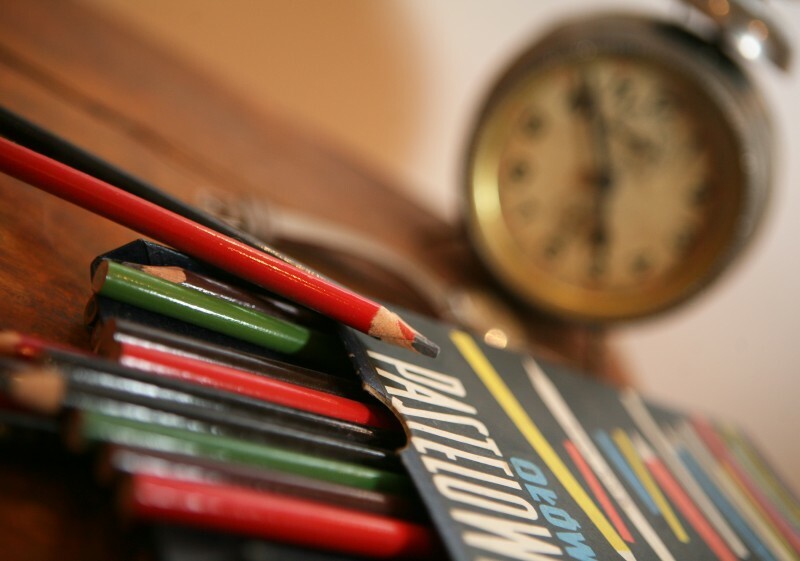 He was using crayons only in the final years of his life. The primitivism of his works can be noticed in the way he outlined all the elements of a work with a thin black line and then he filled the surface with vivid colours. The only pencil outlines that he didn’t managed to fill are from the final years of his life. Because of the poverty that troubled him all his life and economy caused by such poverty he created two-sided pictures, for instance: Teaching Christ/Blessing Christ; St Barbara/ Roadside shrine; St Veronica/ Christ in temple from year 1920. Greek catholic orthodox church was a special source of inspiration for Nikifor. 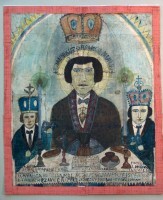 Many of his works show landscape with a silhouette of orthodox church in the background, interior of churches or saints’ effigies seen in a specific way – through the eyes of primitive painter. 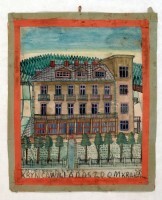 Lay themes of his works were: scenery of Krynica and Warsaw; fragments of architecture –sometimes without any relation to the reality, building interiors, railway stations and railway tracks winding through the picturesque hills. very often he painted portraits of passers-by and of himself. There are many self-portraits (mainly from the thirties of the nineteenth century) that reveal his thoughts about himself and sometimes his high ambitions and dreams. He painted himself as lost in thoughts, smartly dressed, sitting by the easel, during meal, with his raised hand making a gesture of blessing, as a high official or a person of high rank. 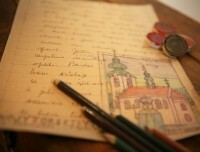 It is estimated that in his arduous life Nikifor painted tens of thousands of pictures, none of which was ever the same. The majority of his works he gave out, lost or sold when he was in need of money. For the first time his genius was appreciated by an Ukrainian painter Roman Turyn. He was a collector of Nikifor’s water-colour works (he collected almost 200 of his works). He made them famous in Paris where they were admired by the painting experts. The idea of exhibition in Paris fell through. Part of Nikifor’s works was included into the joint exhibition of French and Lvivian painters held in the National Ukrainian Museum in 1932. His position of a primitive artist changed in the sixties of the nineteenth century – 10 years earlier artist had carried with him an illustrated beggar’s letter asking for food, money or a piece of canvas and some pictures he offered in return for received help. He gained popularity by another discovery of his genius by a couple of Mr and Mrs Banach, who published articles and a book on Nikifor, entitled ‘Nikifor, Master from Krynica’ written by Andrzej Banach and published in 1957. This couple became his mediators and benefactors, they not only organised exhibitions of his works but they also took care of him by helping him in his everyday life. After years description of the development of the popularity of the painter can be found in the book entitled ‘ History about Nikifor’. First individual exhibition held in Diny Vieny gallery of Paris in April 1959 was a decisive moment that opened an international career of Nikifor. This event was a first step towards a series of successive exhibitions of the primitive painter all over the world. In Poland his works were especially appreciated on the retrospective exhibition in Warsaw’s ‘Zachęta’ held a year before his death. At the time, ‘Matejko from Krynica’ became a member of honour of the Association of the Polish Plastic Artists. In Krynica visitors of health resorts hearing news from the capital started to auction his previously unwanted pictures, which put a definite end to the financial problems of the artist. Despite this fact, Nikifor had never changed his lifestyle – as long as he was able to move by himself – he was present on the walk paths of Krynica to depict and record his primitive outlook on life. 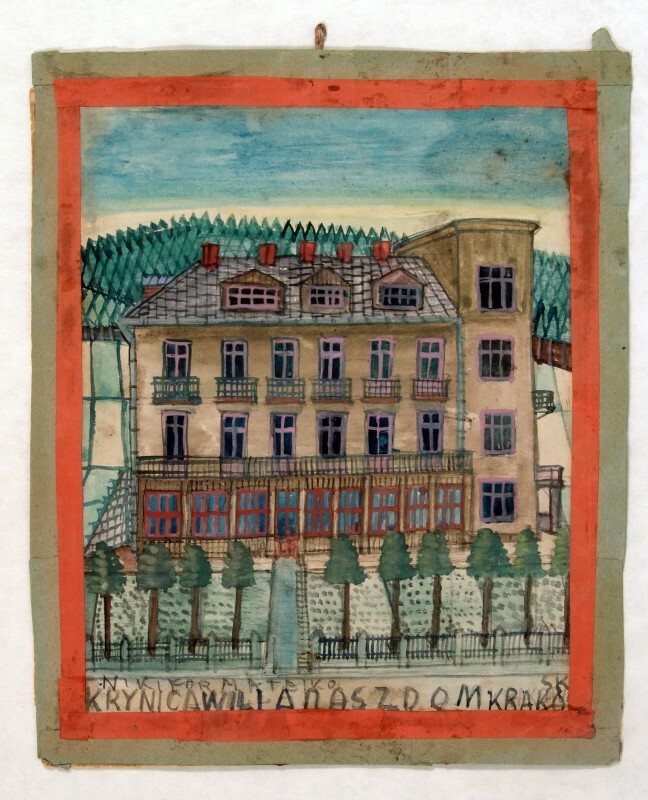 He painted Krynica on his way ‘to work’ as he was used to doing it throughout his whole life. The last eight years of his life were easier for him as he was helped by a painter from Krynica – Marian Włosiński. This man provided homeless Nikifor with a roof over his head, with medical care and, what was the most important for our primitive painter, he was allowed to use his benefactor’s atelier. 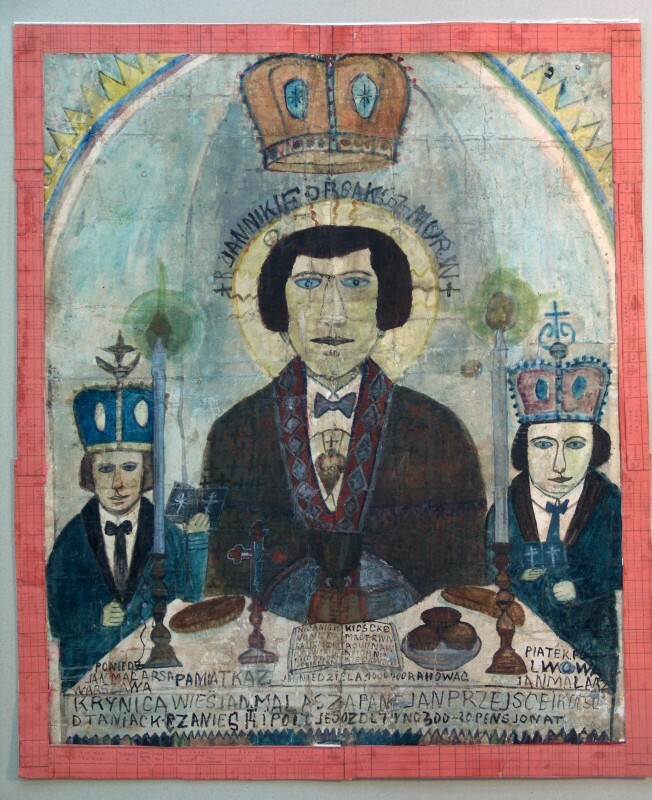 When Nikifor passed away, Włosiński took care to find a decent place in the history of art for ‘Matejko from Krynica’. History of this incredible relation of Nikifor and Włosiński is presented in a feature film of Krzysztof Krauze ‘My Nikifor’. The title role was marvellously played by Krystyna Feldman. Due to the promotion of the cinema production the interest in primitive painter from Krynica was revived and books on his works were reprinted. At dusk of his life Nikifor was famous and popular; his royalties were enough for house, workshop, car to be bought. Unfortunately, he didn’t have enough time for all these investments, the more famous he was , the more weaker he became. He died on October 10, 1968 in a health resort in Folusz near Jasło, till his last days holding a pencil in his hand. There are two inscriptions over his gravestone in Krynica: ‘Nikifor Krynicki’ in Roman alphabet and ‘Epifanij Drowniak’ in Cyrillic alphabet. 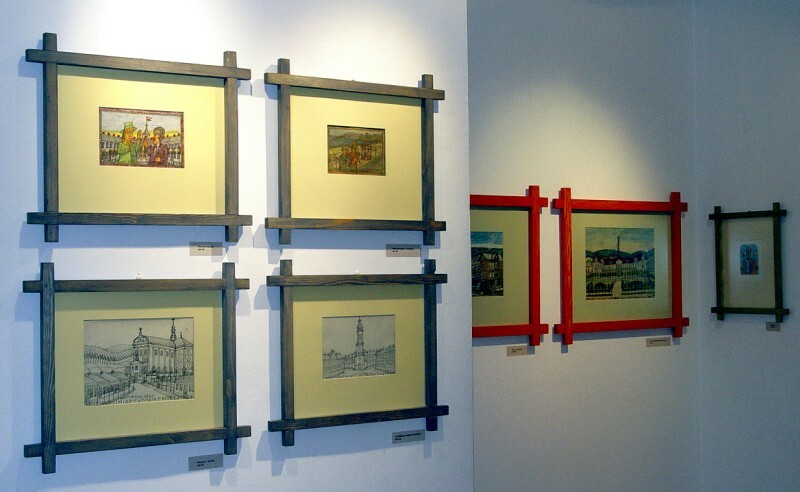 In 1995 in Krynica Museum of Nikifor – Art Gallery ‘Romanówka’ was opened as a branch of the Regional Museum in Nowy Sącz. There is no exaggeration in statement that Nikifor became the most famous ambassador of Krynica in the world. Lately, on the main path leading to the Pedestrian Zone a monument was erected honoring and presenting our painter with a paintbrush in his hand and sitting on the parapet as he used to do in his lifetime.